The Maritime Speaker Series at the Door County Maritime Museum (DCMM) continues on Thursday, March 7, 2019 at 7pm. Rhys Kuzdas, DCMM Curator and Exhibits Manager, will preview his presentation for the upcoming Council of American Maritime Museums conference on the sinking of Leathem D. Smith’s yacht, the Half-Moon, which sank off the coast of Door County in 1946. Of those aboard, only Smith’s daughter Patsy would survive the sudden gale that consumed her remaining family. The presentation charts the events leading up to, during, and after the death of a magnate of maritime industry and a rising political star. Leathem D. Smith’s was one of the most influential shipbuilding companies on the Great Lakes; when he died, the company he built also perished. The now mostly forgotten tragedy shocked the nation for a moment, but ultimately redefined the local community for generations. Speaking about his ongoing research into this pivotal moment in Door County history, Kuzdas will present the harrowing story little-known within the community of Sturgeon Bay. In addition to the subject of the Half-Moon, Kuzdas will also share how the research process works when creating exhibits such as the DCMM 50th Anniversary exhibit “The Water Defines Us: DCMM@50” and the “Shipwrecks of Door County” exhibit, both currently on display at the Sturgeon Bay museum. Attaining a B.A. from Lawrence University in 2015 with majors in History and International Relations, Kuzdas soon developed a passion for local history and community engagement. A US Navy veteran and avid travel and history enthusiast, Kuzdas has volunteered and worked at various non-profits and historical societies both abroad and in his home state of Wisconsin. 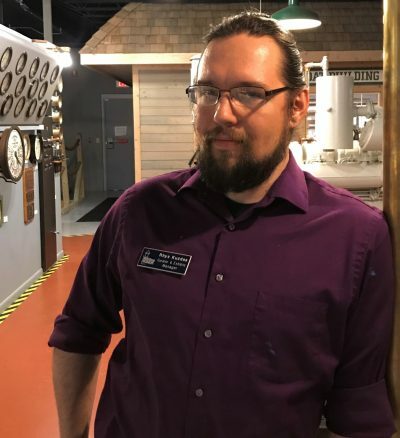 Now the Curator & Exhibits Manager for the Door County Maritime Museum, he is responsible for exhibit interpretation, design and installation of exhibits within all Door County Maritime Museum properties. The Maritime Speaker Series offers an assortment of monthly programs dealing with everything from historical topics to current issues affecting the Great Lakes and the economy that relies on them. The programs are held the first Thursday of each month November through April beginning at 7pm. The Maritime Speaker Series is held in the Reddin Bridge Room at the Door County Maritime Museum in Sturgeon Bay. Admission is free of charge with a suggested non-perishable food donation. Visit www.DCMM.org to learn more about the upcoming Maritime Speaker Series.